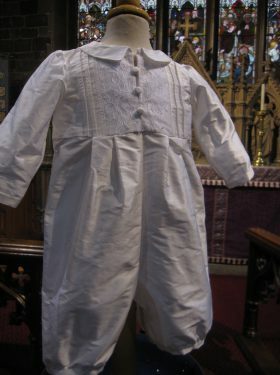 This christening gown was an ablsolute joy to create. 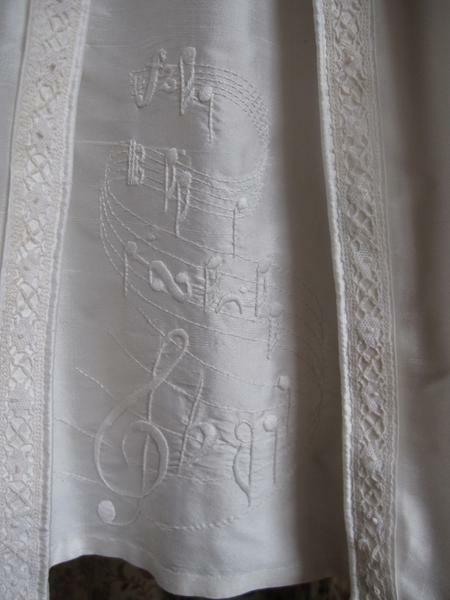 The challenge was to hand embroider musical notes and a treble clef that swirled their way up the skirt. 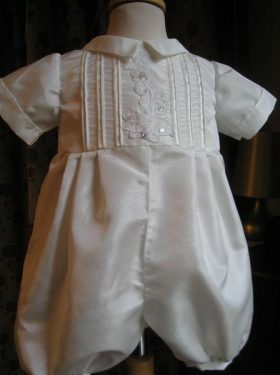 This is a fine example of how the use of embroidery can really make a christening garment personal for your family. 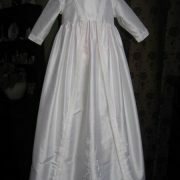 The Lewis Christening Gown is made from 100% pure silk dupion. 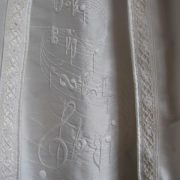 The focused is on the front panel with its beautifully hand embroidered musical notes. 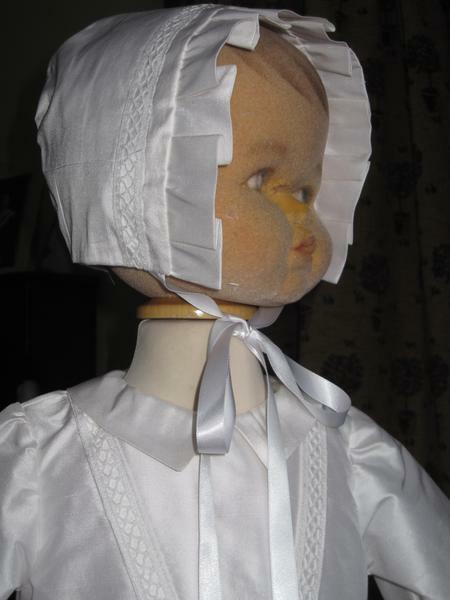 The notes swirl upwards from the base of the skirt towards the front bodice. The skirt gently pleats at the waist. 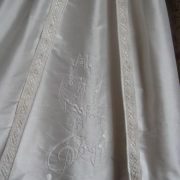 A small front panel is centre to the bodice. 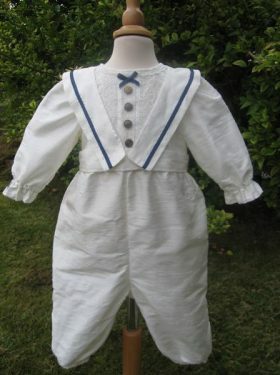 Both bodice and skirt have decorative robings trimmed with vintage braid. 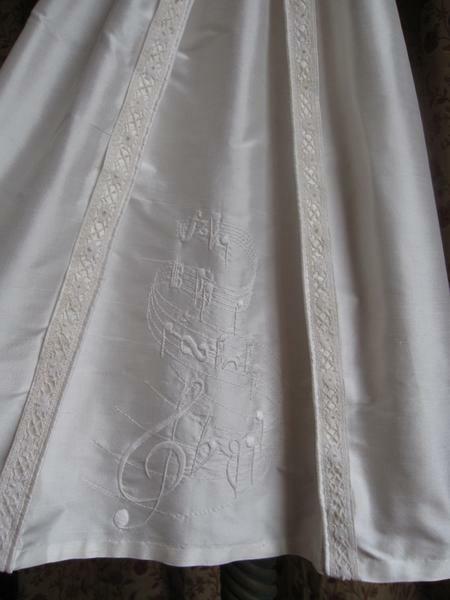 The robings are attached to the gown with an inverted pleat, making sure the embroidery stands out fully. Long sleeves have cuff detail and a shirt collar give this gown a boyish look. 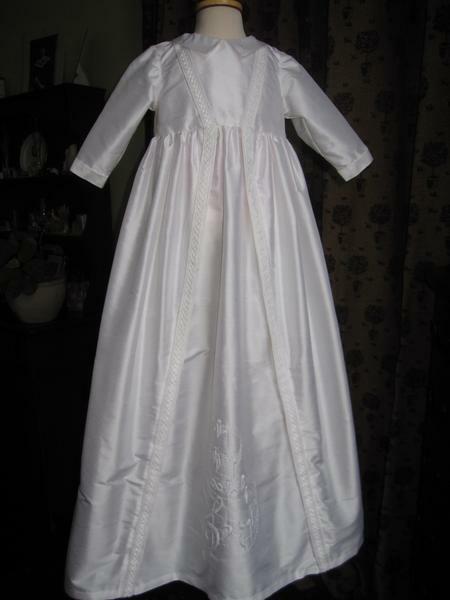 However, if you wish to have a softer look we can always create the Lewis Gown with puff sleeves or short sleeves and no collar to give a look more fitting a baby girl. We received the parcel this morning. THANK YOU SO MUCH for your wonderful work ! I am delighted with the result. 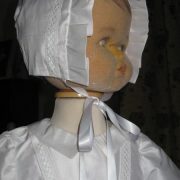 We had a dress rehearsal and Gustave looks like a real doll (if only he could behave like one !). 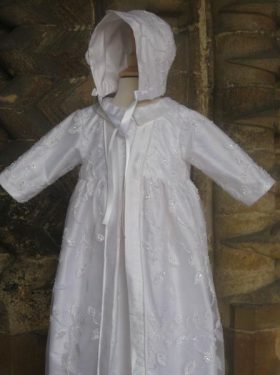 The Lewis Christening Gown is a welcome addition to the range of hand embroidered gowns available from Lttle Doves. 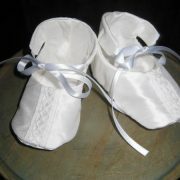 Other embroidery styles and themes can also be encorporated. Please phone or email if you wish to discuss alternative embroidery. We are happy to create any type of embroidery design. 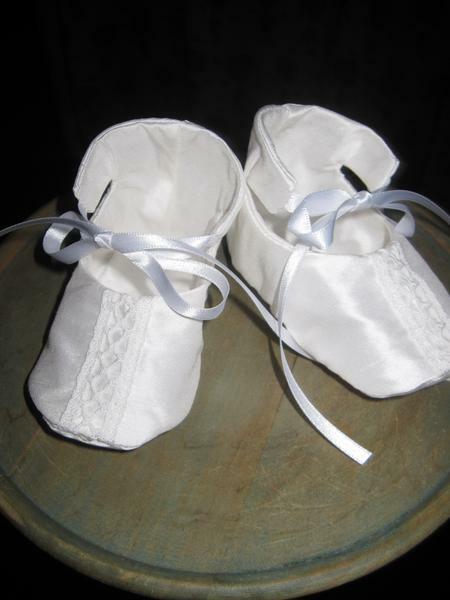 All Lewis Gown accessories are made to match the Christening Gown using the same silk or satin fabric and matching pintuck detail. Please phone or email if you require samples of fabric.